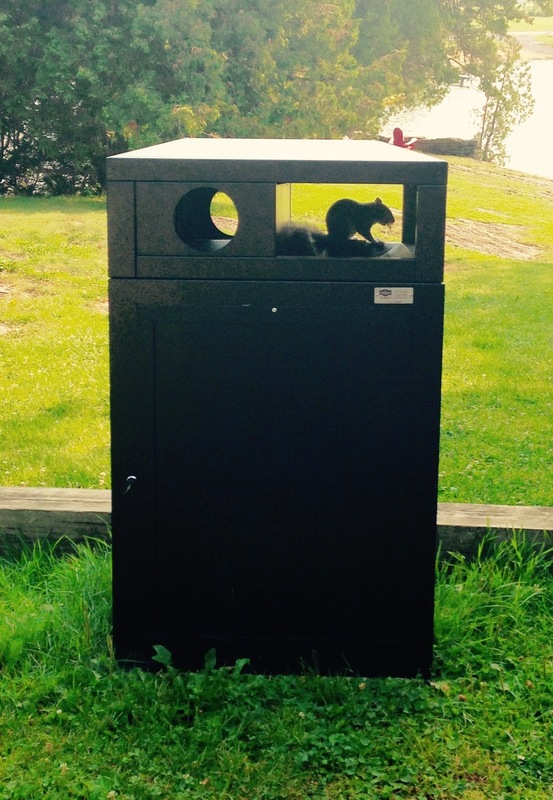 Bonni Brodnick Blog : Just Another "Squirrel Appreciation Day"
Just Another "Squirrel Appreciation Day"
As I was walking to the lake for a morning meditation, my affection for squirrels was reincarnated. In the garbage receptacle by the path was a furry-tailed silhouette with a huge chunk of food in its mouth. When the squirrel heard me approaching it froze just long enough for me to catch it snacking. Click here for my Huffington Post, "Squirrel Appreciation Day: Don't Miss Celebrating!" There is also a piece in Sunday’s New York Times Metro section, “Gray Squirrels, New York 's Furry Cache Machines." I like writing and reading about these quirky creatures who chitter and chatter, then scram and suddenly re-appear to scavenge for more.